Samsung's Galaxy S4 Unpacked event was missing a few key aspects we've come to expect from a major phone launch. There was no word on the OS (Android 4.2.2) and nothing said about the phone's Octo-core processor - mostly due to the fact that it will be Octo-core in some regions and not in others. It also lacked the obligatory gaming demo, used to showcase both the graphics processing and the quality of the screen. But that doesn't mean that the event was a total bust for gamers. 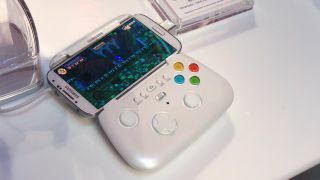 Backstage, Engadget got its hands on a prototype gamepad that Samsung is working on. In the image above, the Galaxy S4 fits neatly onto the unit, but because it communicates over Bluetooth, the gamepad should be compatible with other recent Galaxy devices, including the Note 2 and Note 8.0. Though the unit as a whole looks like a large, glossy meringue, the buttons and joystick alignment are suspiciously similar to Microsoft's Xbox 360 controller design, with the familiar rainbow-coloured A,X,Y and B buttons. It also seems to sport a custom-designed UI for games, but whether this is something that comes with the gamepad, or something Samsung is including in the updated TouchWiz UI, we don't know. This is a great time for Samsung to stake its claim on smartphone gaming, with system's like Ouya raising the profile of Android games, and the Galaxy S4 having a screen of a similar size to Sony's PlayStation Vita. Though, as we mentioned above, this is just a prototype, so no word yet on pricing or availability.